Bruce Weber said his Wildcats beat 'a potential Final Four team' in Oklahoma State. MANHATTAN, Kan. — Thomas Gipson likened the game to a "bar fight," the sort of description that is certain to make the senior-level folks in the Kansas State athletic department shake their head in exasperation. 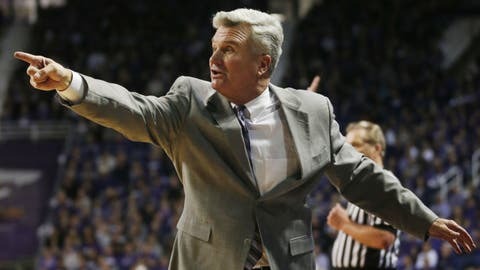 Of course, Wildcats coach Bruce Weber used the exact same term to describe a 74-71 victory over No. 6 Oklahoma State on Saturday — the kind of rough-and-tumble affair both teams were expecting as they opened Big 12 play harboring championship aspirations. "What else can you say?" Weber said. "They’re a potential Final Four team. I don’t think there’s any doubt. And we were able to compete with them and find a way to win." Marcus Foster had 17 points for the Wildcats (11-3), and Nino Williams scored 15, none bigger than the two free throws he made with 5.7 seconds left to give Kansas State a three-point lead. The Cowboys’ Marcus Smart raced up court and threw up a running 3-point try as the final buzzer sounded, but it clanked harmlessly off the rim. By the time it fell to the court, Kansas State was well into celebrating its ninth consecutive victory. "We felt like that was one of the toughest games we’ve played so far," said Gipson, who added 10 points and 11 rebounds. "For us to be young and come out and get a huge win against the No. 6 team in the nation, that feels real good." Le’Bryan Nash scored 20 points, Markel Brown finished with 16 and Smart added 15 for the Cowboys (12-2, 0-1), who were plagued by foul trouble after already missing two of their key players. Michael Cobbins, their best big man, sustained a season-ending Achilles injury on Monday, and freshman guard Stevie Clark — their second-leading scorer off the bench — did not play after he was arrested on suspicion of marijuana possession on Wednesday. "This was going to be an adjustment game," Cowboys coach Travis Ford said. "It’s been a tough week. We lost a major part of our team. We have to adjust." The Wildcats, who’ve made a habit of pummeling opponents during their win streak, tried to wear down the short-handed Cowboys in the first half. They pawed and pressed and got physical with Smart and Nash as much as possible, and both of them were clearly frustrated. Both of them also picked up two fouls late in the first half. Kansas State was unable to take advantage of the brief stretch in which both sat on the bench, though. Foster scored in the waning seconds of the half to put the Wildcats in front, but the Cowboys raced up court and Brown managed to curl in a layup at the buzzer for a 38-37 lead. The senior dished a bit of attitude at the Kansas State student section as he left the floor. Oklahoma State tried to extend the lead early in the second half, and Smart’s dunk and foul with about 13 1/2 minutes left provided a cushion. But Smart decided to do a chin-up on the rim and slap the backboard after his slam, and he was hit with a technical — his fourth foul of the game. While he took a seat, the Wildcats started to gather momentum. Shane Southwell hit a 3 from in front of his own bench to knot the game 52-all with just over 9 minutes left, his first points of the game. A few minutes later, Nash picked up his fourth foul, and Cowboys coach Travis Ford put Smart back in the game. "It’s always hard to sit for that long and come in and try to get into a rhythm," Smart said. The Wildcats went right at him, and Smart wisely backed down on a couple of occasions to avoid picking up his fifth foul. That allowed the Wildcats to surge ahead, taking a 65-60 lead when Foster slashed through the lane and curled in a layup with 3 1/2 minutes remaining. That matched the biggest lead of the game, and the gritty Wildcats managed to hit just enough free throws — and make just enough stops — to hold on at the end. "They just outplayed us," Nash said. "They played hard every time. They don’t care what the situation is, they just play. That’s what we need to do. We played tentative and we need to play hard every game. That’s what I’m going to do from now on. Play 100 percent and give 100 percent to this team because that’s what they need."